Welcome to the Byte by Byte Resources page. This is a collection of the products I think you’ll get the most value from in your software engineer interview prep journey. I don’t share any resources on here unless I’ve personally vetted them and decided that they are worth every penny. Different resources are good for different people, though, so definitely be sure to do your research and only buy something if you really think it will benefit you. However, if you think something you see on here looks like your cup of tea, you can buy it with confidence that you’ll get your money’s worth and improve your interview skills. Note: Some of these links are affiliate links, which means I get a commission when you buy through these links (at no additional cost to you). However, I only recommend resources that I have used myself and truly feel will benefit my readers. Never fail another dynamic programming interview and finally get the job you deserve. This in depth video course takes a deep dive into dynamic programming for interviewing so that you can achieve true mastery without years of work. This course dives deep into the FAST Method, which helps you solve any dynamic programming problem, even if you've never seen it before. If you're serious about getting that Big 4 job, this course will get you one big step closer to that goal. Does dynamic programming scare you? If so, you’re not alone, but it doesn’t have to be that way. I wrote this book to introduce people to the FAST method – a method I developed for solving dynamic programming problems with ease. This free ebook shows you how to use the FAST method to take any dynamic programming problem from an inefficient brute force solution to an optimized dynamic solution. It then takes you through 5 different examples of common dynamic programming problems to really enforce the FAST methodology and understand how to apply it during your interviews. 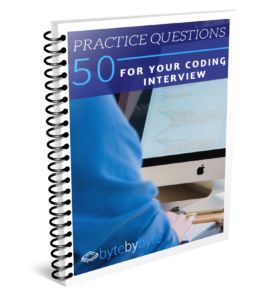 InterviewCake is a great alternative to the many directories of coding interview questions out there. Rather than focusing on a massive assortment of different questions, InterviewCake carefully curates the questions included and provides rich explanations. Not only that, but you can code up your answers directly on the site and also get hints if you’re stuck solving a problem. Get 50% off your InterviewCake membership here! Cracking the Coding Interview is the book that I used when preparing for interviews back in college and is basically the bible of interview prep. The current edition contains 189 different practice questions on every possible topic that could come up during your interview. Since this is a very general-purpose book, not all of the sections will be relevant to everyone, but you will certainly be able to find everything that you need to know in this book. It also provides a good overview of the interview process as well as information on some of the top companies like Google, Apple, and Microsoft.